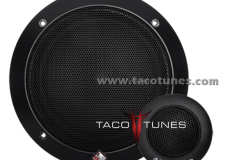 To install Rockford Fosgate Prime R165-S Component Speakers into your Toyota Tundra, you will want to use tacotunes.com speaker adapters designed to work in your Tundra. The Rockford Fosgate Prime R165-S Component Speakers require a 5.1″ cutout diameter for the mid range speakers. The Rockford Fosgate Prime R165-S Component Speakers tweeters will require a 1.83″ cutout diameter. The Rockford Fosgate Prime R165-S Component Speakers will fit you your Toyota Tundra without any cutting, drilling or modifications to your Tundra. The P165-S is a 6.5″ 2-way component system with 1″ soft dome tweeters and is rated at 60 watts RMS. The system includes a pair of tweeters, two woofers with grilles, integrated crossovers, and mounting hardware.